What do orangutans have to do with cleaning? 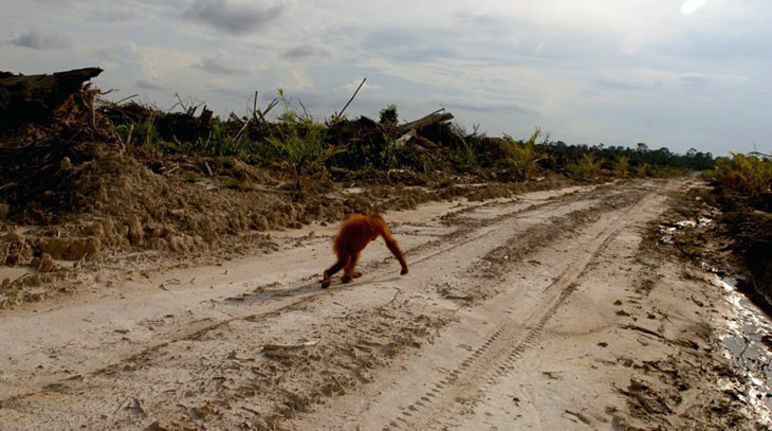 The issue of illegal deforestation to produce palm oil is often in the media. But have you ever wondered what images of sad-eyed orangutan orphans have to do with detergent? At least 10% of the 58 million tons of palm and palm kernel oil produced each year, is used to make soaps, detergents and other consumer products. So when we make, sell or buy cleaning products containing palm oil, we are indirectly responsible. When virgin rainforests are cleared to make way for palm plantations, it destroys the vital habitat for endangered species like orangutans, elephants and tigers, and its indigenous population. The smouldering peat (partly decayed plant material) causes the noxious smoke that covered Indonesia and Malaysia last year (2016), and releases methane – a green-house gas 34 times more potent than carbon dioxide. Should we try to avoid palm oil then? Many experts say this could make the problem worse. Instead we should be encouraging industry to grow palm oil more environmentally and socially responsibly, and supporting those who buy raw materials and finished products containing sustainably-produced palm oil. In 2004, the Roundtable on Sustainable Palm Oil (RSPO) was formed between industry, investors, retailers and Non-Government Organisations (NGOs), with the objective of ‘promoting the growth and use of sustainable oil palm products through credible global standards and engagement of stakeholders’. RSPO drew up eight principles for sustainable palm oil that would prevent forest fires and protect the local people and wildlife. Oil produced to these principles can be certified by RSPO. All manufacturers and suppliers of products, such as detergent, in the Palm Oil supply chain, can become signatories to RSPO. Buying from RSPO certified farmers ensures the are using responsibly-grown palm and palm kernel oil. So with global agreements and growing consumer demand for certified palm oil, why do we still have a problem? Although many big firms (timber as well as palm oil) have signed zero-deforestation pledges, and Indonesia has banned deforestation, it is proving extremely difficult to control practices carried out over vast and remote forested regions. For example, once a ‘slash and burn’ operation has cleared the trees, the peat continues to burn underground, making it hard to extinguish and identify its source. In a bid to improve the monitoring and enforcement of its rules, the RSPO has announced that it will publish digital maps of all its members’ palm oil concessions by the middle of this year, except in Malaysia due to legal issues. These maps will help to improve transparency and alleviate growing concerns about its effectiveness. Which is good because the alternatives to palm oil may even be worse. Although some organisations are calling for a complete ban of products containing palm oil, this would mean that the estimated 4.5 million people who earn their living from palm oil production would need to find some other way to support their families and communities, or return to poverty. Palm trees produce four to ten times more oil per metre of cultivated land than other oil crops, such as sunflower, soybean or rapeseed oil. So banning palm oil could actually lead to even more forests being converted into agricultural land. The smooth texture of palm kernel oil used to produce detergent is not easily or cheaply replicated. So if RSPO Certified industries are not supported by consumers, the oil will still be produced but without checks or incentives in place, and the efforts of the International community could be reversed with devastating results. Although the palm oil story is happening overseas, we can make a huge difference in Australia by purchasing from RSPO certified suppliers and driving the demand for sustainable palm oil. Supply Chain Certificate Holders are listed on the RSPO website. However understanding how Green Palm relates to the supply chain can be confusing, so it is much safer to buy products which have been independently certified against Standards that require RSPO Certification, such as the GECA 2012 Cleaning Product Standard, and the Global GreenTag Cleaning Product Standard. Supporting the farmers and manufacturers who are RSPO Certified, means you are helping orangutans, Sumatran tigers and elephants, and the forests they need to survive. Fresh Green Clean teaches procurement and facility managers how to manage your supply chain to make sure you are not adding to the palm oil and other sustainability concerns. Find out more about our management workshops.